Synopsis: It was love at first sight for Lady Viola the night she met the dashing viscount John Hammond. 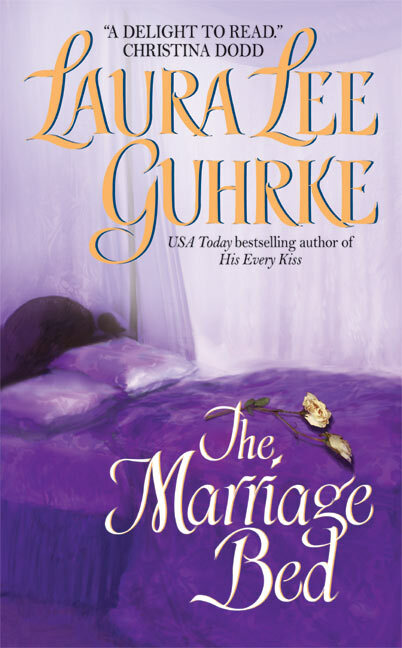 Swept into a whirlwind courtship, it wasn’t until after their vows had been spoken that Viola learned the shattering truth: her beloved John had never loved her, had married her for her fortune…and worse still, saw nothing wrong with that. Heartbroken, she vowed never again to let the deceiving scoundrel into her bed. My Thoughts: I had my mind made up before I ever started this book that I wasn’t going to like it. I didn’t like the character of John in the first two books of the series and just didn’t see how LLG would redeem him. He was a man who married for money and then left his wife in order to pursue his sexual exploits in what seemed to be the bed of every other woman in London. When his cousin dies and it is forced upon him to produce an heir he must try to win Viola’s affections and persuade her to give their marriage a second chance. I really enjoyed the character of Viola ever since she schemed to bring Anthony and Daphne together in Guilty Pleasures. I thought she deserved better than John and felt like he had a lot of work to do in order make up for the past 9 years of adultery. As I read the book, I just wasn’t sure that he did enough. Sure, he seduced her back into his bed, but I didn’t feel that he did enough to cause Viola to forgive him and fall in love with him again. Maybe that’s just me. I tend to read too much into my books sometimes, tend to personalize too often. But then, John made the ultimate sacrifice. He made a speech that rivaled the one Anthony made in Guilty Pleasures. The man made a fool of himself all for the sake of proving his love to Viola, and even I forgave him. Verdict: This was Very Good. It was great seeing Anthony and Daphne (Guilty Pleasures), and Dylan and Grace (His Every Kiss) again and I enjoyed seeing all of the couples interact together. In spite of myself, I found myself really liking this story and I was so glad to see that LLG made John a redeemable and even likable hero. Holly ~ It definitely was. I was surprised, because I didn’t expect to like it. I ended up really loving him by the end. Meh, i didn’t like this one. I couldn’t forgive john. Izzy ~ I didn’t think I would either. Even up until John made the grand gesture, I didn’t think he’d been redeemed enough. What can I say. I’m a sucker. ACK!! This reminds me I have to put your book in the mail! Glad you like this one, I did too! Nath ~ I totally had my mind made up that I wasn’t going to like this one because I hated John so much. LLG did a great job at telling this story.Wena ~ Make sure you get the others in the series ~ Guilty Pleasures, His Every Kiss, and She’s No Princess. I’ll be reading SNP soon, hopefully!